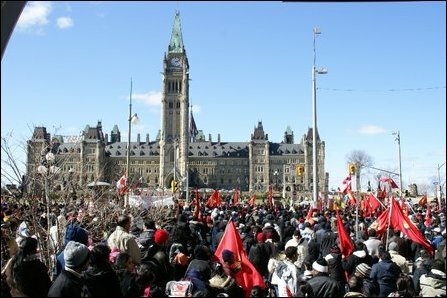 Protest by Canadian Tamil expatriates continued Saturday with several thousands joining the protest, CTV news broadcast announced. "The demonstrators, who arrived largely from Toronto and Montreal, are part of worldwide Tamil protests against what they describe as a deadly military offensive by the Sri Lankan military. Shouting "Tamil Tigers, freedom fighters," the protesters called on Canada to reverse its 2006 decision to list the Liberation Tigers of Tamil Eelam as a terrorist entity under the Anti-Terrorism Act. They are also calling for an immediate ceasefire," Canadian daily Globe and Mail reported. Six expatriate Tamils, V . Yogendran, M Sivaneswari, 54, K Thulasigamany, 59, Julius James, 34, N Pushparajamani, 46, and N Thaiyalnayaki, 67, are on a hunger-strike in Ottawa joining their two British and two French collegues who have undertaken similar extreme form of self-deprivation to highlight the plight of their friends and next of kin who are facing a dire situation in Vanni. "We don't even know if [our family] are living or not," said protester Kalyany Nagarajah, who was born in Sri Lanka and lives in Toronto. "They just want to destroy the Tamil people, that's what they want," the Globe report said. "We've asked [the United Nations] for an immediate ceasefire. We're very worried, of course, of the hostilities that are taking place but particularly worried for the civilians that are in the combat zone [in Vanni]," said Canada's Foreign Affairs Minister Lawrence Cannon Thursday, according to a report in National Post. "The humanitarian crisis in Sri Lanka has continued to deteriorate, causing grave concern to the international community and demanding urgent and co-ordinated action to end this conflict," Mr. Ignatieff said in a statement, according to the National Post report.